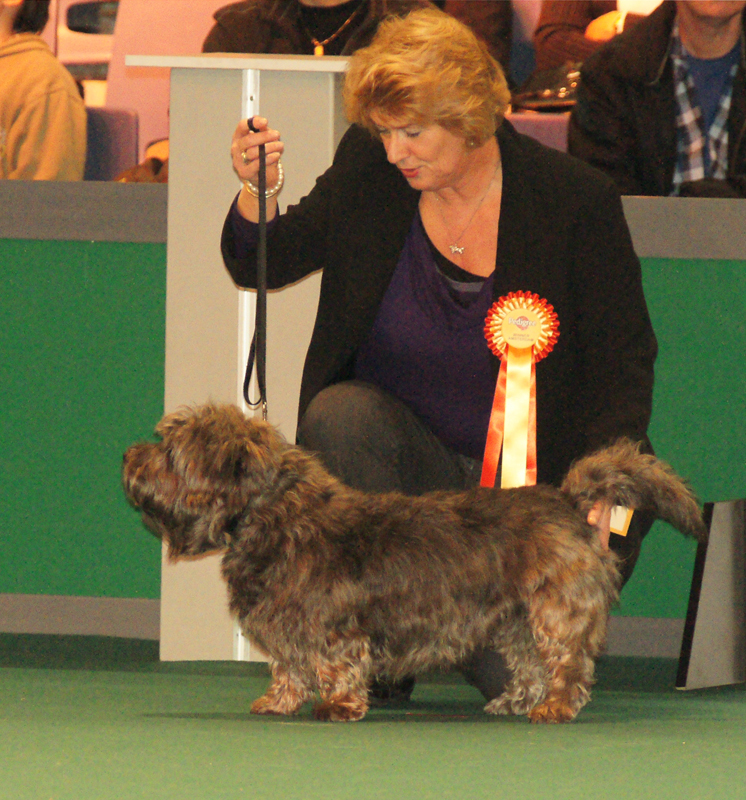 Best of Breed Glen of Imaal Terriers at the Amsterdam Winners Show was Gornatua George James. A three year old dog bred by Pete Bijleveld. She will be getting back to you! If you have emailed Jean Rogers within the last few days and haven’t received a reply, don’t fret as she will be getting back to you…….as soon as she recovers from food poisoning! Earlier this week the question was asked if anybody knew who the “not identified” person was in the twenty year old photograph of Glen of Imaal Terrier people at Birmingham National. There was thought it could be Sue Boswell but Sue, even though admitting to a rugby top of similar colour, was pretty positive that she had never had a late 80s feather cut like that person is sporting. The question though is now answered. Lin Smith says it was Anna Roxburgh sitting next to her! Anybody else with any archive photographs? The Crufts schedules (for next March)have been out a while but is Birmingham National after a new record? Six months before the show the schedule drops into the letter box. Will you know where yours is come next March and the closing date? Possibly that is what they are counting on; everybody realising they will loose it so will enter early. For anybody who wants to Terrier Day is Friday 7th May and Kathy George (her second time giving tickets) is judge of the day. The AKC/Eukanuba Championship (12th & 13th December) at Long Beach, California will see 9 Glen of Imaal Terriers for judge Robert J Shreve. When THAT television programme came out we all wondered how long other “fancies” would be safe. The Supreme is the cat equivalent of Crufts and this is how it was celebrated. Who will be next? Archives that need your help! This was taken just outside the Glen of Imaal Terrier benches at Birmingham National in 1990; isn’t everybody young! Memory is going though and one person isn’t recognised so can anybody help? 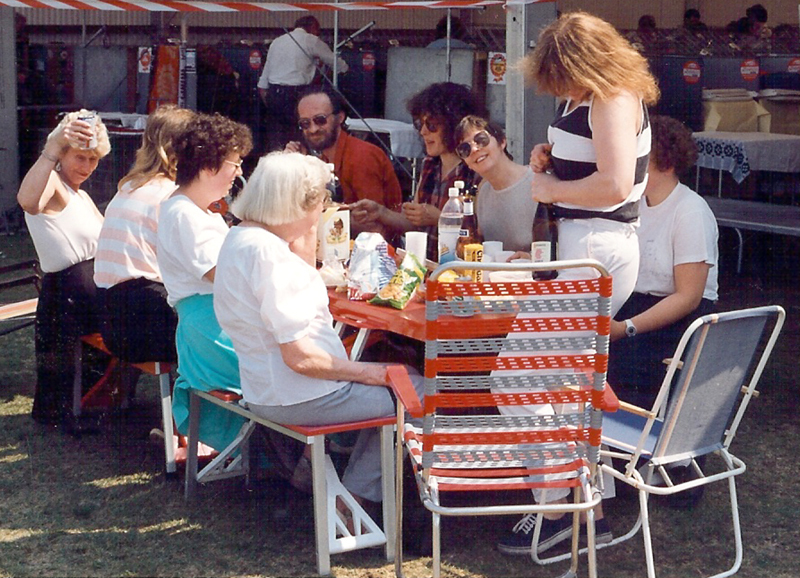 Back left (toasting the photographer) is Brenda Jones & opposite her is Gareth ? Next to Gareth is Liz Gay & then comes Ro Whinn-as she was then. Norma Wilkinson, partially concealed by Sue Phillips opening a bottle of wine, is next. Then there is Linda Smith’s mum, Linda herself but who is the person between her and Brenda?